Both major candidates running for Missouri State Treasurer emphasize their commitment to those with disabilities. The GOP nominee for State Treasurer Thursday unveiled a special needs coalition, a group of advocates for the developmental disability community. 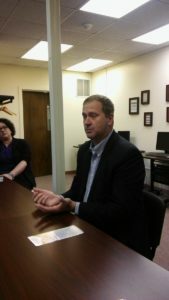 State Sen. Eric Schmitt (R-Glendale) launched the coalition at Easter Seals in Columbia. Schmitt faces former State Rep. Judy Baker (D-Columbia) in November. He spoke to Missourinet about the landmark 2010 autism insurance reform bill he sponsored. “You literally have thousands of kids now accessing services, and doing things they couldn’t do before,” Schmitt says. Schmitt worked with former State Sen. Scott Rupp (R-Wentzville) and former State Rep. Dwight Scharnhorst (R-Manchester) to pass the bipartisan 2010 bill, which was signed by Governor Jay Nixon (D). Schmitt’s son, Stephen, was born with a rare genetic condition and has epilepsy. Schmitt says his son inspired him to run for public office and to be a champion for all Missourians, especially those living with developmental disabilities. “And seeing the challenges that he deals with it, being nonverbal on the (autism) spectrum, having seizures, really inspired me to want to make a difference,” Schmitt says. Baker, who served in the Missouri House from 2005-2009, tells Missourinet she is committed to disability rights, noting she supported the ABLE Act and filed a bill in the House to increase asset limits. Baker also supports reforming and expanding Medicaid. She also notes she was an aide in college to a developmentally disabled person, which helped her understand the needs of those with disabilities. Schmitt, who’s served eight years in the Missouri Senate, says there hasn’t been a major realignment in state government in about 40 years. Schmitt notes some programs for special needs children are in the Department of Elementary and Secondary Education (DESE), while others are in the Department of Economic Development. Schmitt says “we’re past the time” to have a better alignment of agencies to serve individuals with special needs and with disabilities. The winner of the November election will replace incumbent State Treasurer Clint Zweifel (D), who has served in the post since January 2009.